Susan Chrysler White is a recipient of the Joan Mitchell Foundation Award in Painting and Sculpture and the National Endowment for the Arts. She also received two international awards for the Project Milagro Del Dia. AMACUP Award (Mexican Association for Arts and Popular Culture): most creative new project, Mexico City, Mexico (1998), as well as Greenwich World Hunger Association Grant for Milagro del Día Project (1999), a two year project helping Chichimeca Indian women in rural central Mexico build artistic cooperatives for sustaining communities. 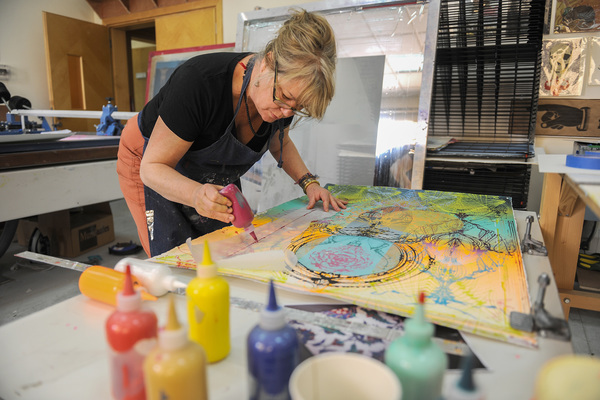 Susan has exhibited her work in 30 solo shows and over 100 group exhibitions nationally and internationally. Her work is collected by the Philadelphia Museum of Art, Rutgers, American Embassy in Algeria, Hewlett-Pacakard Corporation, CA, The Prudential Insurance Company of America, New York, among others. Her work has been reviewed in over 80 periodicals including The New York Times, Artforum, Art in America, Arts Magazine, Art News, New York Magazine, The Philadelphia Inquirer, The Chicago Sun Times, The Chicago Tribune, New Art Examiner, Review magazine, and over fifty other publications.